481. 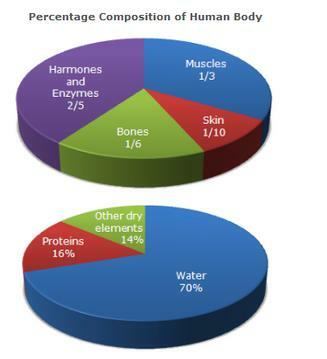 What percent of the total weight of human body is equivalent to the weight of the proteins in skin in human body? 482. What will be the quantity of water in the body of a person weighing 50 kg? 483. What is the ratio of the distribution of proteins in the muscles to that of the distribution of proteins in the bones? 485. In the human body, what part is made of neither bones nor skin?